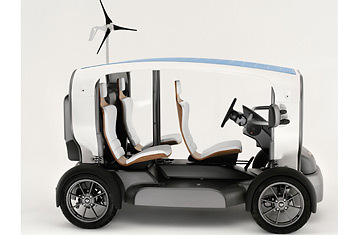 The trouble with most green-concept cars is that they require regular "refueling" with hard-to-get hydrogen or ethanol. The Venturi Eclectic runs solely on wind and solar power. Solar cells blanket the rooftop, and a wind turbine provides extra juice. When that's not enough, a backup electric outlet can recharge the three-seat Eclectic in five hours.